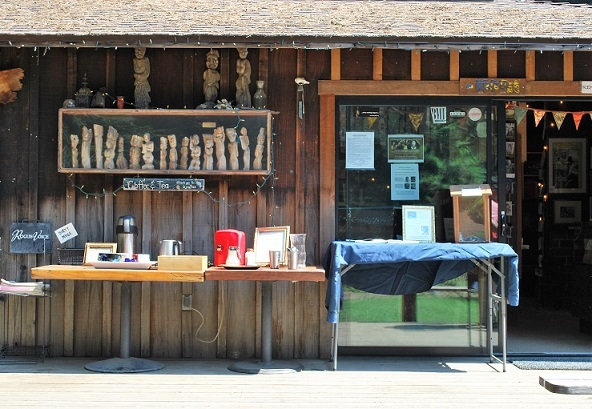 The welcoming front porch of the Henry Miller Memorial Library in Big Sur. A recent trip up the California Coast to rediscover wandering roots took a detour at the Henry Miller Memorial Library in Big Sur. Tucked away on a curve of the Pacific Coast Highway the library came to be following the death of Miller in 1980 in the cabin of his longtime friend Emil White. One makes their way down a path — a piano in the woods to the left, Jesus on a cross of computer monitors to the right. Keep walking and turn right at the ping pong table and enter Emil's old cabin. In among the books that you would expect to find in a library named after one of America's most polarizing authors — including a play by Jack Kerouac first published in 2005! — there was an apparent anomaly unto itself. A CD of music — Songs Hotbox Harry Taught Us. The songs, performed by local musicians who also call themselves Songs Hotbox Harry Taught Us are said to be written by a mythical hobo — Hotbox Harry. The sole track on the CD not written by Hotbox Harry was written by the group itself. It is the closing instrumental track, So Long Hotbox Harry. The disc opens with the haunting, So Much for Breakfast. Musician and library director Mike Scutari, who put the project together, first encountered Hotbox Harry while playing in a local bar in 2010. Harry handed him a list of the 20 most important American roots records that Mike should own. And that was the last Mike had seen or heard of Hotbox Hank until he received a package in 2013 from Harry with the lyrics to 13 songs which would become the CD, Songs Hotbox Harry Taught Us released in 2014. The band still performs in the Big Sur area and you can stream the songs on Songs Hotbox Harry Taught Us or visit the Henry Miller Memorial Library and pick up your own copy of songs that evoke another time. Another people. Another America that is on the verge of vanishing if not for the efforts of Hotbox Harry and the musicians Mike Scutari rounded up to keep alive this deeply American traditional music.